R = ρL/A where ρ is the resistivity (specific resistance) of the material of the wire. [Note that the resistance of the wire after stretching is greater than R since k < 1]. Note that if a wire of resistance R is stretched so that its length becomes n times its original length, its area of cross section becomes (1/n) times its original area of cross section. The resistance of the wire therefore becomes n2R. Since n = 1.01 the resistance after stretching is (1.01)2R =1.02R, nearly [Option (c)]. We have R’ = R/k4 as shown in question no.1. Since the change (decrease) in the radius is 1%, k = 0.99. This gives R’ = 1.04R, nearly. 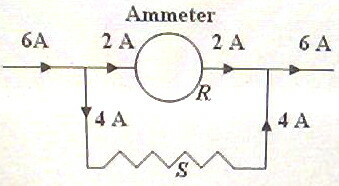 2×R = 4×S, on equating the potential difference across the ammeter resistance R to the potential difference across the shunt resistance S.
H = [V/(P+r)]2Pt = [V/(Q+r)]2Qt where V is the emf of the power supply. [V/(P+r) is the current in the load resistance P and V/(Q+r) is the current in the load resistance Q]. (6) A 12 V battery having internal resistance 0.2 Ω is being charged at a current of 2 A using the circuit shown in the figure. The generator which charges the battery has a terminal voltage of 16 V at this charging current. 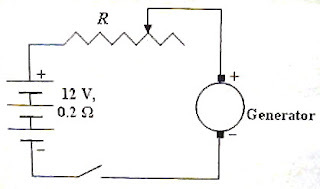 What is the value of the resistance R connected in the circuit? The voltage between the terminals of the battery (terminal potential difference) while the battery is being charged (which is equal to the sum of the emf of the battery and the potential drop across its internal resistance) = 12 + 0.4 = 12.4 V.
[0.4 V is the voltage drop (2×0.2 volt) across the internal resistance of the battery]. 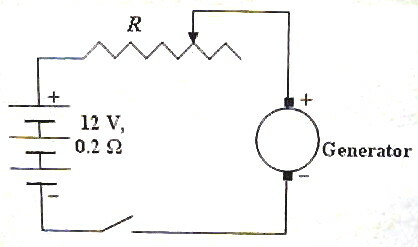 Therefore, the voltage drop across the series resistance R is (16 – 12.4) V = 3.6 V.
Since the charging current is 2 A, we have 2 ×R = 3.6 from which R = 1.8 Ω. You will find some useful multiple choice questions (with solution) in this section here.